Mom, the Intern: How to end holiday guilt. How to end holiday guilt. This beautiful time of year simultaneously brings out both the best and worst in me. I love all the ways I can feel inspired to help others and remember the precious gift of my Savior, Jesus Christ. But sometimes, I see all that others are doing and feel like I'm not doing enough. I haven't decorated early enough or well enough, I'm not getting involved in enough service projects, I don't have enough Baby Jesus Christmas traditions and I can't bake half as well as my friends and neighbors. And then there's the cutesy neighbor gifts I never get around to making, the well-intended visits to see the Mesa Temple Christmas lights that never happen, the overwhelming amount of traditions I can never seem to fully participate in and all the other demands that leave me feeling like a crappy human being at the end of the day. In actuality, I recognize that these expectations are set by no one but myself as I internalize what I see on social media and elsewhere. Someone posts a picture of their cute boutique tree and I choose to take it personally for absolutely no reason. It's kind of dumb. But I don't think I'm the only one who does this. I've been thinking a lot about how I can eliminate this unnecessary burden of holiday guilt from my life, since I chose to put it there in the first place. I came up with a list of some things I could do and thought, why not share this with my blog readers? Let's give up the guilt, shall we? 1. Go on a social media fast. Let's be honest here -- most of us use social media to show others what we do best. We thrive on "likes" and comments, don't we? Of course we're going to put our best foot forward and hide the other one behind the screen as we participate on Facebook, Instagram and Twitter. Sometimes, we fail to remember that social media rarely reflects a person's real life. If you're like me and tend to equate the artsy, rounded-corner filtered images on someone's Instagram feed with their reality, maybe it's time to step away from the screen. Log out for a week. Take a breather. Let your mind remember what life was like before Instagram and Facebook. You'll feel better when you're ready to join the virtual world again. Plus, you'll suddenly have time to actually DO all the things your friends have inspired you to do with their fabulous pictures and posts. 2. Don't let Pinterest get you down. Remember, Pinterest is mostly fantasy! The pins that go viral are the ones that look amazing, but that doesn't mean they're worth your time or even possible. And just because someone pinned it doesn't mean they can do it. Take a look at my Pinterest boards. I've successfully completed/acquired about 2 percent of my pins, failed about 5 percent and haven't even attempted 93 percent of them. Pinterest is a lot of fun and an ingenious way to get inspired, especially around Christmas, but it's not a template for reality. If your holidays look like they jumped straight out of Pinterest, you are either a) Martha Stewart or b) crazy, and those are arguably the same thing. 3. Take joy in what you CAN do. So, you have this friend/sister-in-law/cousin/mom with nine kids who does Elf on the Shelf every day, sings in the church choir, has her fabulous tree and all the Christmas decorations up by Thanksgiving, volunteers at the soup kitchen every week and delivers Krispy Kremes in handmade boxes to all of her neighbors. Well ... that's great! You can be proud of those accomplishments (and enjoy those Krispy Kremes). But it's important not to measure our own success against that of others. Make Thanksgiving and Christmas your own. Figure out a few simple and doable traditions you want to incorporate into YOUR holiday season and do the best you can. They will undoubtedly bring joy to your family and others. 4. Be happy for what you have and share it with others. An ungrateful heart leads to comparisons which ultimately lead to guilt, because the grass is always greener in your neighbor's yard. Start with gratitude.You feel bad about your hand-me-down decorations and your lack of Pinteresty traditions? Some people are working long hours, dealing with health challenges and living on a meager budget ... and they might not be able to participate in any holiday traditions this year. Remember that. Then step it up and lend a helping hand. Decorations and fancy desserts are nice and all, but the holiday spirit lies in giving to others. 5. "Stop the glorification of busy." Speaking of Pinterest, I saw this quote there a few months ago and I confess, I needed to read it. There is no inherent value in a busy life. Doing things all day and night does not necessarily make you a good person. It might even make you a person with poor time management skills and an inability to delegate. If you want to have time to do what counts -- bond with your family, serve others and fully enjoy this holiday season -- you may have to cut out the things that don't really matter as much as you think. I've actually tried doing Christmas both ways -- extremely hectic and filled to the brim with FUN! but time-consuming activities and obligations, versus low-key, relaxed and simple, and I much prefer the latter. Make time for what counts and eliminate the rest. The empty spaces will be filled with happy memories and the real purpose of this time of year. What would YOU add to this list? 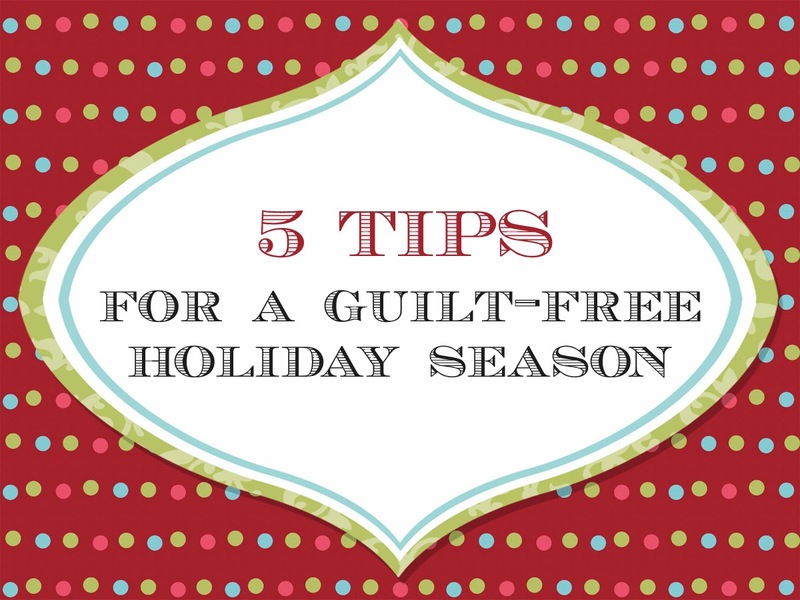 How can we get rid of the guilt to better experience the "reason for the season" this year? I love this post! Those opening paragraphs describe my feelings exactly, and your suggestions are so great! One thing that has helped me in years past is to make deliberate and specific plans. I guess it kind of ties in to your #3. I'll start with a *short* bucket list (4-5 things) that are really important to me, and I'll pick specific days to do them. That way, instead of getting caught up in trying to do/make/bake/visit *everything,* I know I've prioritized and made pre-planned decisions about what will help me and my family really enjoy the season. Thanks again for writing this! I always love your posts. Amen to this post. Thanks for the reminder of what is important. The tip that touched me the most was, "taking joy in what you can." I really need to focus on this and take that piece of wisdom to heart and action. One thing that I forget that has helped me in years past is remembering that I don't have to do it all each Christmas: every body's party, my own holiday party, cards, tons of decor, big shopping trips... each year can look different. My goal was to get all my shopping done before the snow came. What a silly goal living in Utah. Now my goal has changed to getting it all done before December 1st. I want to eliminate the stress that comes with finding the perfect gifts. Last year I would wake up in a panic from dreams that it was Christmas morning and I didn't get my husband anything. And randomly throughout the day my heart would drop into my stomach as I frantically tried to remember what the date was and how much time I had left to shop. I decided if I get all of my shopping done early this year then I can have more time to create memories with my family and not feel guilty that I was out shopping instead. This is amazing!! Such a great reminder. I was getting pretty down after seeing all the cute advent calendar ideas and huge, amazing Christmas trees in people's perfect, cozy, wood-floored houses. Well, I've got a tiny, fake tree on the counter that my one year old can't reach! So it's worth it to not constantly have to keep her from ruining the ornaments and lights, haha.